Although new microplastics are constantly entering the oceans and some types of plastic have a relatively low density and therefore drift at the water surface, the microplastics concentrations at the surface of the oceans are often lower than expected. In addition, microplastics have repeatedly been found in deep-sea sediments in recent years. What happens to the microplastics in the ocean surface layer? How do they get to great water depths? "Our hypothesis was that microplastics, together with the biogenic particles in the seawater, form aggregates that possibly sink into deeper water layers," explains Dr. Jan Michels, member of the Cluster of Excellence 'The Future Ocean' and lead author of the study, which was published in the international journal Proceedings of the Royal Society B today. "In addition, we assumed that biofilms that are present on the surface of the microplastics play a role in the formation of aggregates," explains Michels, who led the investigations during his time at GEOMAR and now works at Kiel University. Such biofilms are formed by microorganisms, typically bacteria and unicellular algae, and are relatively sticky. To investigate their influence on the aggregation, comparative experiments were conducted with plastic beads that were either purified or coated with a biofilm. "Together with biogenic particles, the biofilm-coated microplastics formed the first aggregates after only a few hours, much earlier and faster than the microplastics that were purified at the beginning of the experiments," says Michels. On average, 91 percent of the microplastics coated with biofilm were included in aggregates after three days. 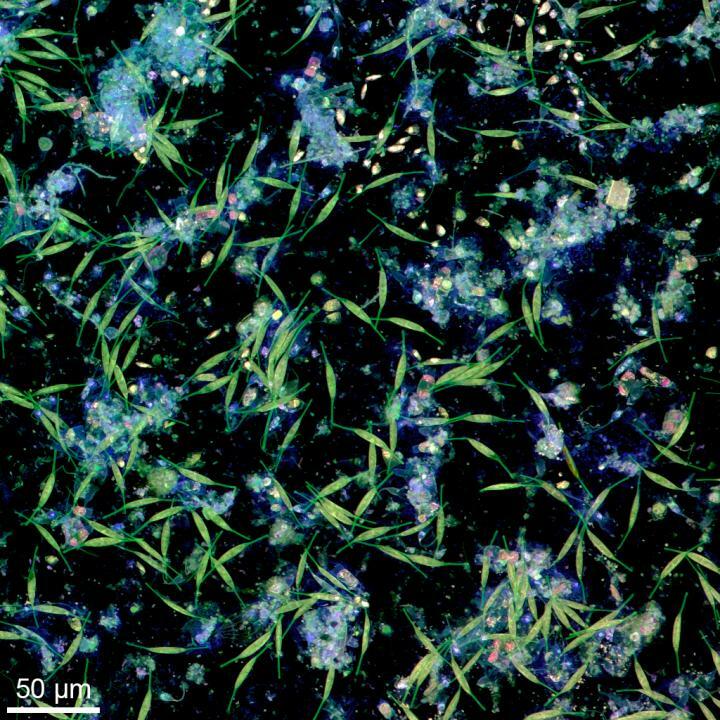 "If microplastics are coated with a biofilm and biogenic particles are simultaneously present, stable aggregates of microplastics and biogenic particles are formed very quickly in the laboratory," summarises Michels. In many regions of the oceans, the presence of both numerous biogenic particles and biofilms on the microplastics is probably a typical situation. "This is why the aggregation processes that we observed in our laboratory experiments very likely also take place in the oceans and have a great influence on the transport and distribution of microplastics," explains Prof. Dr. Kai Wirtz, who works at the Helmholtz-Zentrum Geesthacht and was involved in the project. This could be further investigated in the future through a targeted collection of aggregates in the oceans and subsequent systematic analyses for the presence of microplastics.